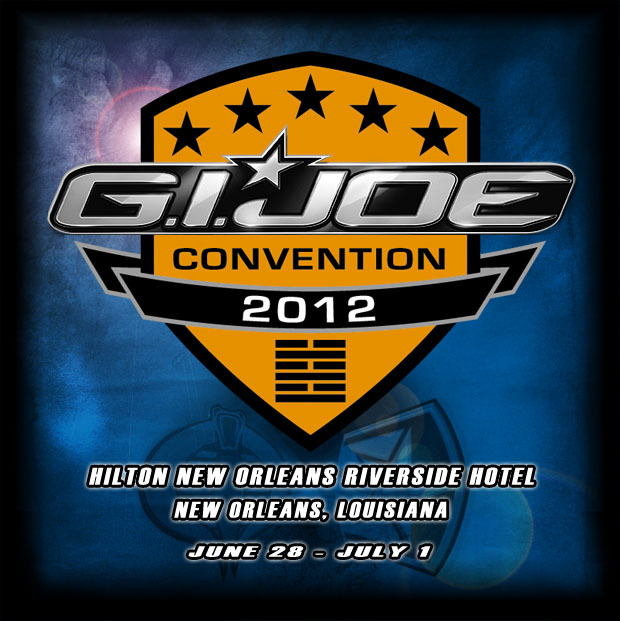 If you’re fortunate enough to be in New Orleans, LA this weekend, we’re sure you’re enjoying yourself at the 2012 GIjOE Collector’s Club Convention. With all the fans, special guests, special events and myriad Joe merchandise for sale, national conventions are THE place to be for Joeheads every year. Unfortunately, I was not able to attend this year’s big blowout in the Big Easy, but I’m sure coverage will be forthcoming from numerous fans soon. Our best wishes to those who did make it down there. Please feel free to submit and share your experiences and photos with others here on The Joe Report. Have a great time! GO JOE! 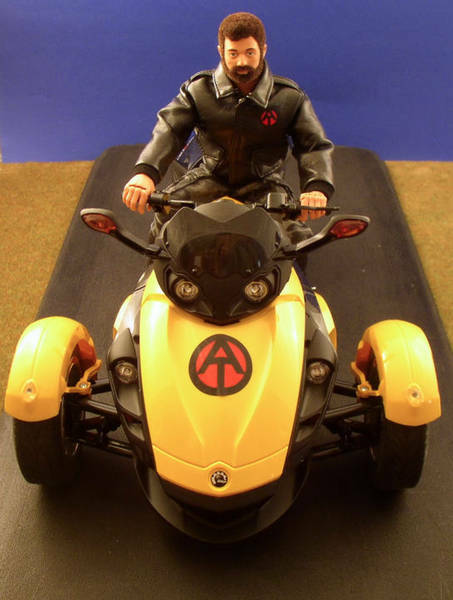 12 years ago, members of the Long Island Division of the GIjOE Collector’s Club created a great Joe video called the “Jeep Drag 2000.” If you haven’t taken this “wild ride” before, click on the video link above or HERE to start the show. Enjoy! The Sandbox is Dead. Long Live the Sandbox! A June 26, 2012 screenshot of the venerable Usenet discussion group, alt.toys.gi-joe, aka “The Sandbox,” shows a dramatic decline in use over the last few years, as fans have switched to more versatile forums such as the Trenches and Facebook. Back on March 5th, I had written a short article about the 17-year old “Sandbox” discussion group and how it seemed to be on its last legs as a forum for GIjOE fans. Today, I browsed over to alt.toys.gi-joe to pay another visit. I was startled to discover that the once beloved group has essentially screeched to a halt in terms of usage. 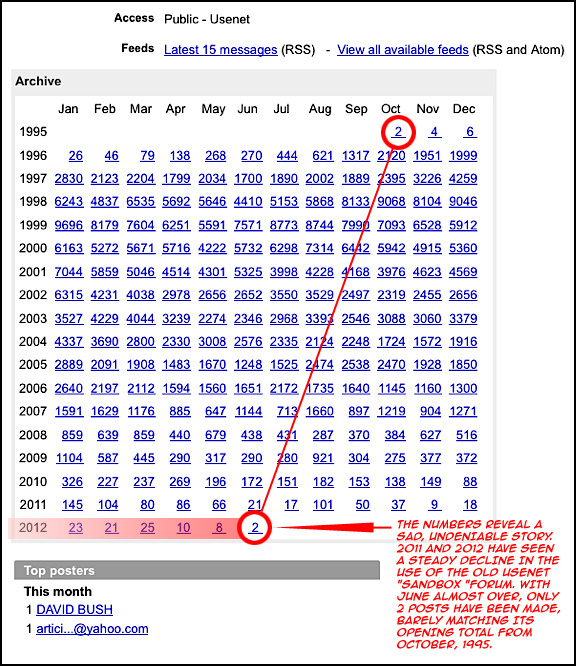 A quick peek at the “About this Group” statistics link reveals that during the entire month of June, only two posts had been made (see screenshot above). I could almost hear the tumbleweeds blowing by my browser’s window. Longtime computer users will remember the venerable newsgroup as the first, BEST, “virtual” gathering place for GIjOE collectors. For over a decade, it was THE place to be (for fans who were online). 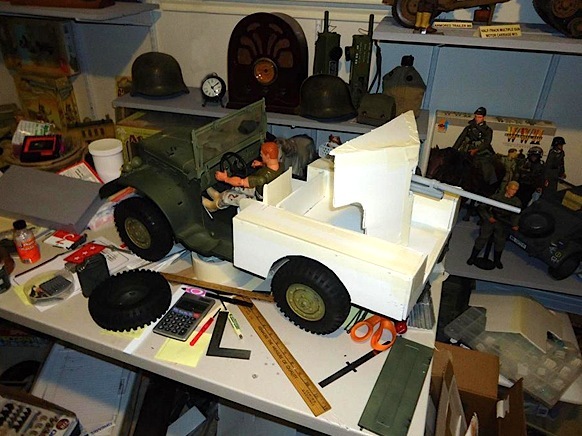 The once-popular group provided ‘boxers with a fast, reliable (and moderator-free) environment in which they could quickly and easily exchange news, tips and information about the 1:6 scale hobby. In addition to being a vital information hub, the Sandbox also brought fans together in a more personal way; creating a unique online “community” which became a daily fixture in many people’s lives. Friendships were formed and bolstered by countless trades and transactions conducted on an almost daily basis. The one, the only, Sandbox logo. The Sandbox exclusive U-Boat Commander in its unique wooden display box. The Sandbox even inspired a little marketing of its own. It began when collector and graphic designer Daryl Williams created a logo for the group (see above). The logo stirred up interest within the online community and Williams went on to produce some GIjOE-inspired fonts as well (still available for sale HERE). 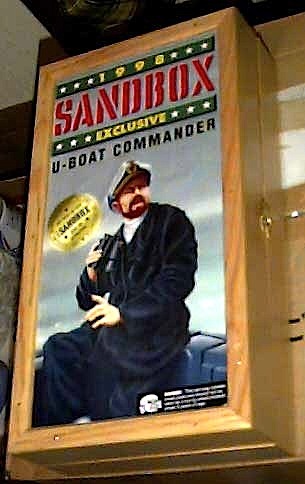 Soon after, enthusiastic ‘boxers began to consider the creation of a “Sandbox Exclusive” figure, and after much work, the idea became a reality with the production of an exclusive “U-Boat Commander,” a custom figure spearheaded by such talented individuals as Greg Brown, Alan Dawson and Aaron Luck. The figure was a stunning success. Today, that figure remains a fitting testimonial to the comradery, talent and dedication of the group’s members, all made possible by communiques posted in the Sandbox. (Editor’s note: If you own one of these exclusive figures, you own a piece of history!) To learn more about the Sandbox exclusive U-Boat Commander figure, read the actual posts saved over on the “Sandbox Chronicles” website found HERE. As of this moment, the Sandbox still exists, but as I was reminded today, nothing stays the same forever; not even the loyalties of GijOE fans. Day by day, thousands of us have “voted” with each click of our mouse. With our online choices, we’ve shown an undeniable preference for newer, more capable websites such as the Trenches Forum, the Fuzzheadquarters Forum and Tanker’s all-new Sandbox page over on Facebook. All great destinations in their own ways. Some fans likened the original Sandbox to the “Wild West;” a wide open, unregulated community with limited capabilities and no oversight. Today’s more carefully moderated forums have more features and capabilities it’s true, but they can also feel like a “gated community” at times, requiring passwords, moderator approval and other restrictions. Indeed, the raw honesty of the old, uncensored Sandbox posts may soon become a thing of the past. 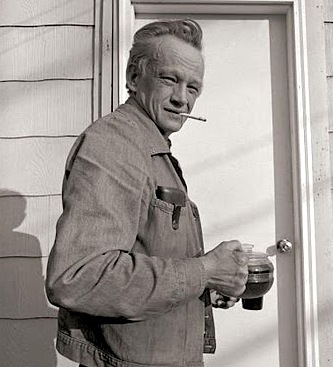 Gone with the winds of change, and all those tumblin’ tumbleweeds blowin’ past our browsers. I’m the world’s biggest fan of artist/illustrator, Larry Selman. 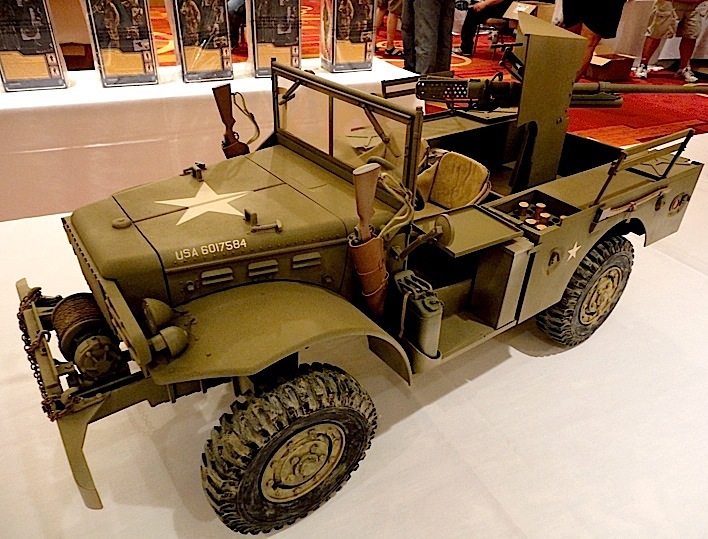 His work on Hasbro’s “Classic Collection” line and more recently, the national GIjOE Collector’s Club’s convention exclusive figure sets, is largely responsible for breathing life back into the 1:6 scale hobby we enjoy today. The success of Selman’s efforts are undeniable. 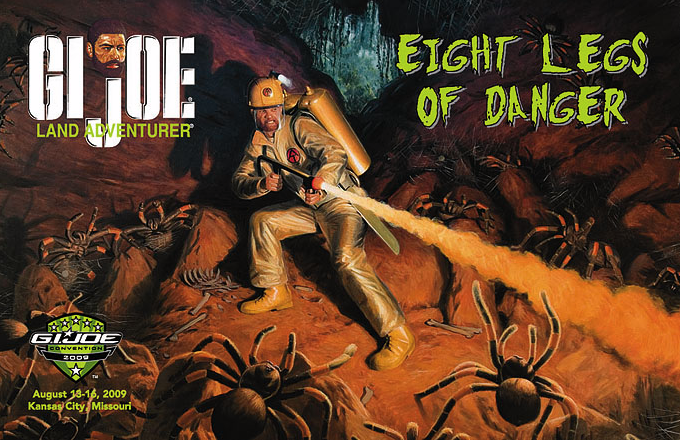 His artwork now stands shoulder-to-shoulder with both of the earlier great GIjOE illustrators; original ’60s artist, “Super” Sam Petrucci and the ’70s Adventure Team Artist, “Dangerous” Don Stivers. “How many GIjOE paintings have I done altogether? I’m really not sure. At one point, I had counted 125 pieces of art for Hasbro’s Classic Collection and the Club Convention exclusives. Obviously the majority of them were for box covers, but I also created insert illustrations for some packages that required 3 separate pieces (usually the vehicles). There were some that were, to my knowledge, never used. I’ve been an illustrator and fine artist for 30 years. GIjOE came around at the best time for several reasons. The first was the changing book cover market. I was getting out of that, so it was good timing to have another well-paying line of work. The second reason was that it granted me the opportunity every illustrator wants to have; as much artistic freedom as you want and still get paid regularly. Most of the time, my sketches were accepted by Hasbro’s art directors with little problems. There were a few problems with marketers, but as a whole, it was all a great experience for me both professionally and personally. My first couple of years illustrating for GIjOE opened up the possibilities of big, sweeping, epic pictures. That wasn’t possible with my other illustration assignments, especially book covers, because they are small and you have a lot of type to work around (or in). By contrast, the artwork and construction of GIjOE’s packaging was designed to stand out on a very crowded and busy toy shelf. The action, details and color would entice the customer into picking up the box to look at it and to open the front panel of the box to see what was inside: the toy. 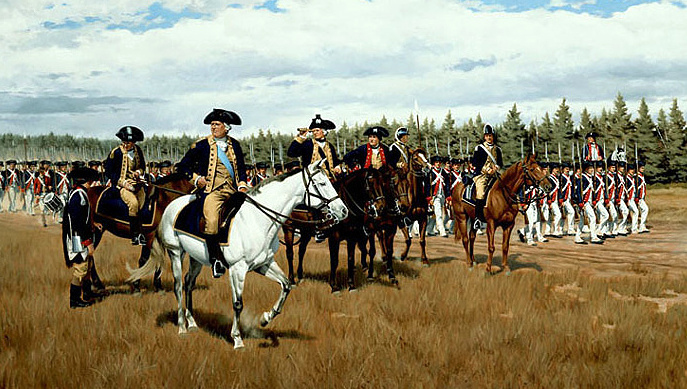 Selman’s epic painting of George Washington remains one of his best. 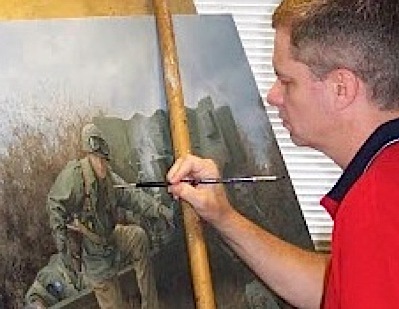 There were a few paintings I thought actually changed my career—George Washington was one of those. George was a 4th of July GIjOE Special. That package was the pinnacle of this early package design style the Classic Collection. I worked longer and harder on that one painting than any other, and also spent more money on props, models, horses and reference photography than anything before. The bill for all of those materials cost me well over $1,000, but the effort shows in the painting’s final composition, perspective, and details. It even won a prestigious award for art and package design! Unfortunately, it was the beginning of the end of this approach of selling GIjOE. Wal-Mart was starting to call the shots more and more on the packaging for all sorts of products, particularly toys. They are the number one toy seller and when they say jump you say, “how high.” Over the next several years, they shrank the box size more and more and beat Hasbro up on cost. These factors meant that space for the artwork was reduced to a small back section of the box. I’ve also had a great time working with Brian at the GIjOE Club. He brought me in a few years after Hasbro had closed down the 12″ Classic Collection line, and since that time, I’ve illustrated seven of the 12″ figure convention boxes and one for the 3 3/4″ line. 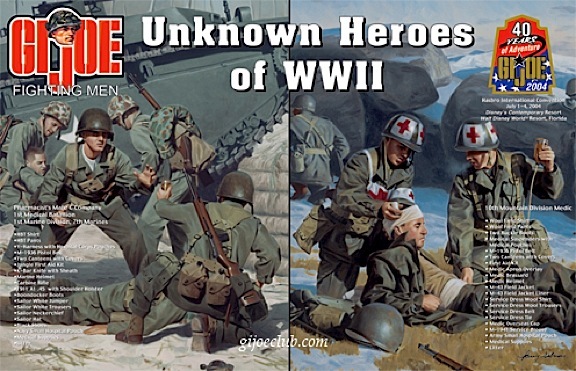 The first painting I did for the club was for the Unknown Heroes of WWII exclusive, which is still one of my favorite box covers. The idea and design worked out well for both figures. There was a different feel for the two illustrations as it needed to be but they worked well side by side which doesn’t always happen. 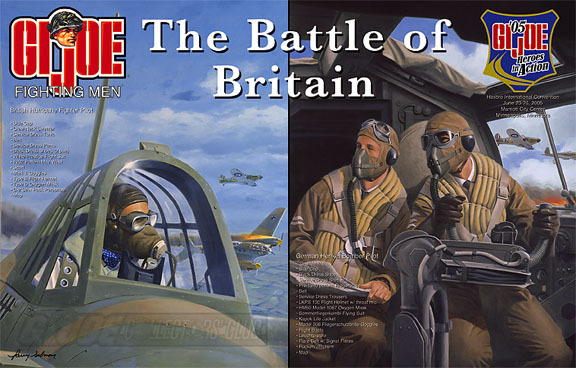 The Battle of Britain set had a different goal which was to show the two combatant’s point of view of the same action. 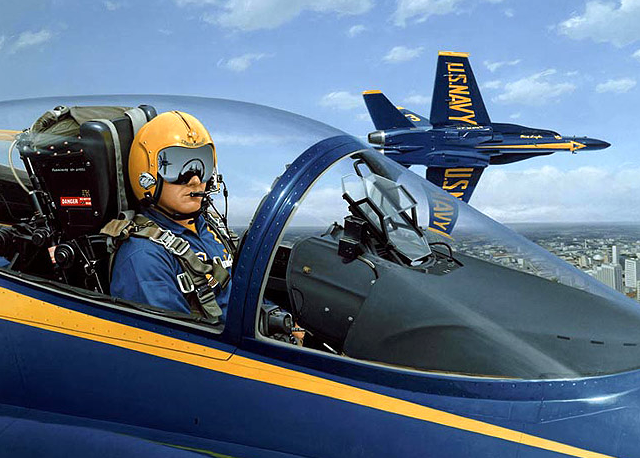 A difficult set to work because aircraft cockpits are very cramped. Getting a good feel for the whole thing was hard. 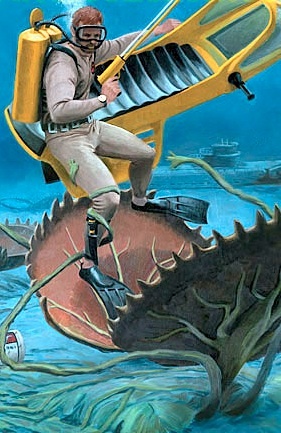 Closeup of Terror on the Sea Floor box. Terror on the Sea Floor was a fun picture to work on and rigging up the props was interesting and of course there was no underwater photography. For the wet suit I used close-fitting thermal underwear and the air tanks were two fire extinguisher bottles strapped to a Vietnam ruck sack frame. Sometimes making up the props is very time-consuming, like Eight Legs of Danger. For that one, I used the fire extinguisher tanks again but made the fire suit out of tin foil and a paper paint suit. I went to a paint store-bought a cheap paper suit and sprayed glue all over it and then the tin foil to join them. It worked out well and then came building the spider cave and Spiders. I went to a craft store that and bought a rubber spider with poseable arms and some pipe cleaners. The rubber spider only had moveable middle legs and I needed the all the legs to move. I clipped the front legs off and attached pipe cleaners for the front, posed and light it the way I wanted and boom you get spider reference that works. A lot of work but it was the most fun picture I worked on. It had the 1950s monster feel that Brian and I discussed at the outset. 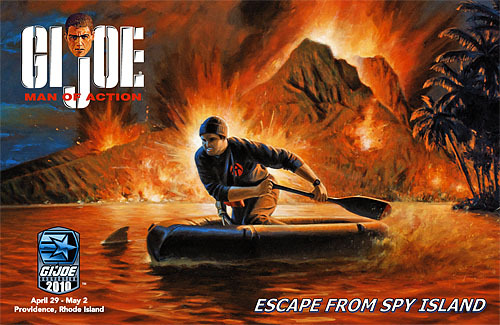 Escape From Spy Island, Drive Into Danger and Last Man Standing all had the prop and modeling process as the previous boxes. 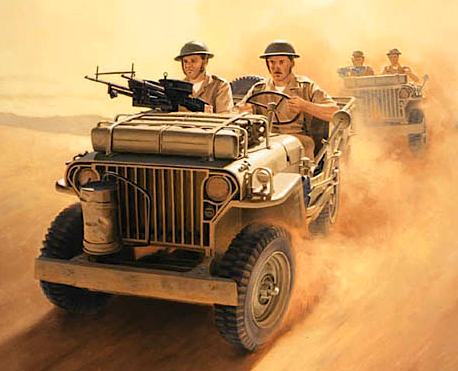 Last Man Standing is the heavy weapons assortment to the vehicle in Drive Into Danger. I guess the question it’s trying to answer is, is this the last man standing going to be the last of the line or will there be more? One always like to wonder about a line like GIjOE and where it might go in the future. 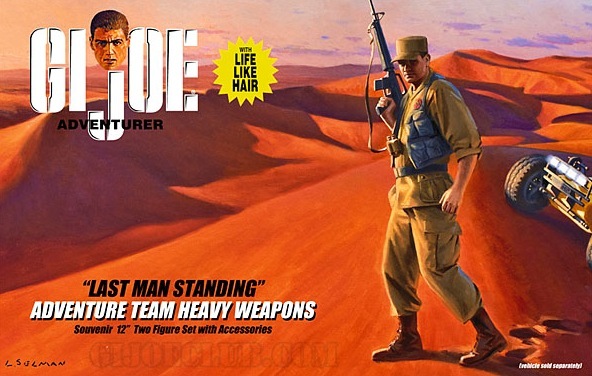 Box art for the upcoming GIjOE Con’s “Last Man Standing” exclusive 12″ figure set. 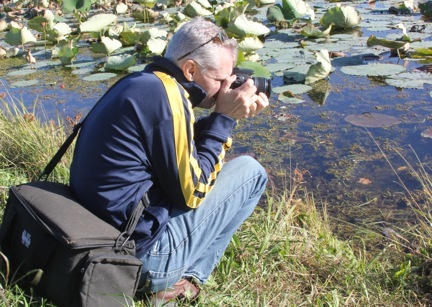 Bottom Line: Larry Selman’s work speaks for itself, but I’ll offer a few more words of my own. SUPERB. TIMELESS. FANTASTIC. And I could go on and on. 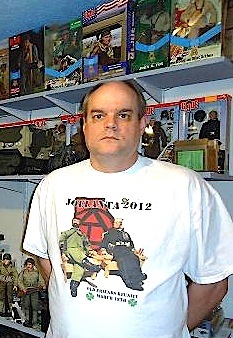 Thank you Mr. Selman for all of your contributions to the GIjOE hobby and for your help with this article. 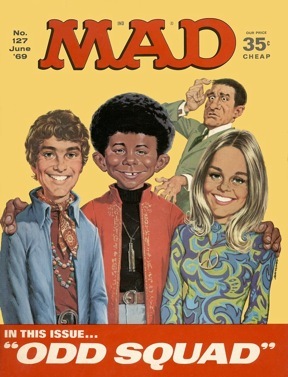 To envious movie and TV stars, singers, and others, any mention in MAD magazine is considered to be a “badge of success;” a sort of public “flaying” to be celebrated, not avoided. It’s like being lambasted by the legendary insult comic Don Rickles; you may wince while it’s happening, but you can’t wait to tell all your friends about it afterwards. The unique publication, first launched as a comic book in 1952, quickly evolved into a satirical humor magazine, famous for its hilariously irreverent “send ups” about anybody and anything going on in pop culture. It was only a matter of time before it would dissect GIjOE and later, GIjANE. “G.I. 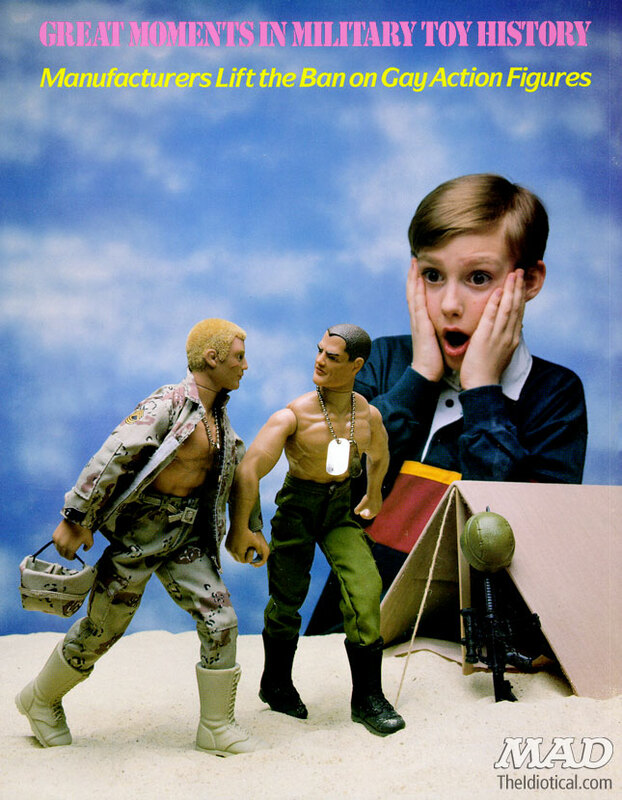 Joes” as soldiers (not the toys) were first accorded MAD’s acerbic attentions by appearing in a story entitled, “G.I. Shmoe!” (issue #10, 1954). 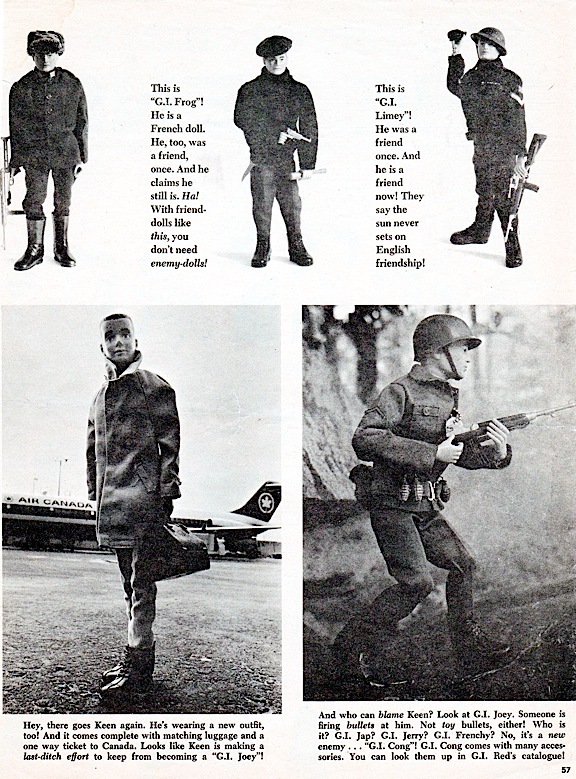 The Korean War had just ended, and the magazine’s publishers felt it was time for some wacky military humor. G.I. 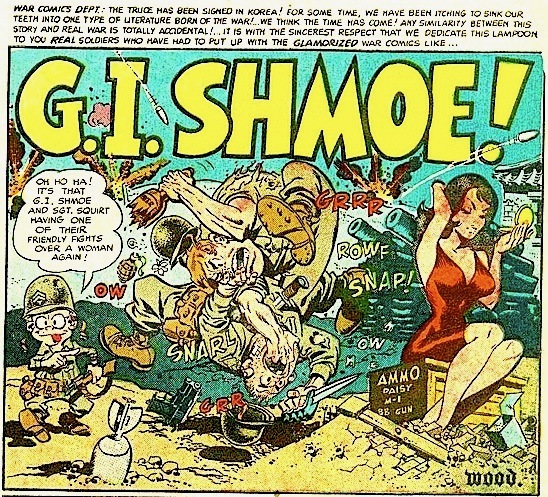 Shmoe would poke fun at military service personnel, and was written and illustrated by one of the most prolific MAD artists, Wally Wood. 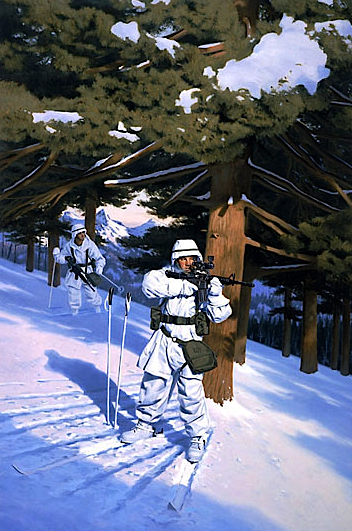 In the piece, Wood depicts lusty American soldiers chasing after every curvaceous woman they can find. Read the entire silly story HERE. 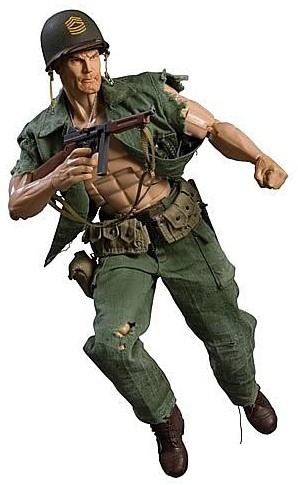 Ten years later, Hasbro’s iconic “G.I. 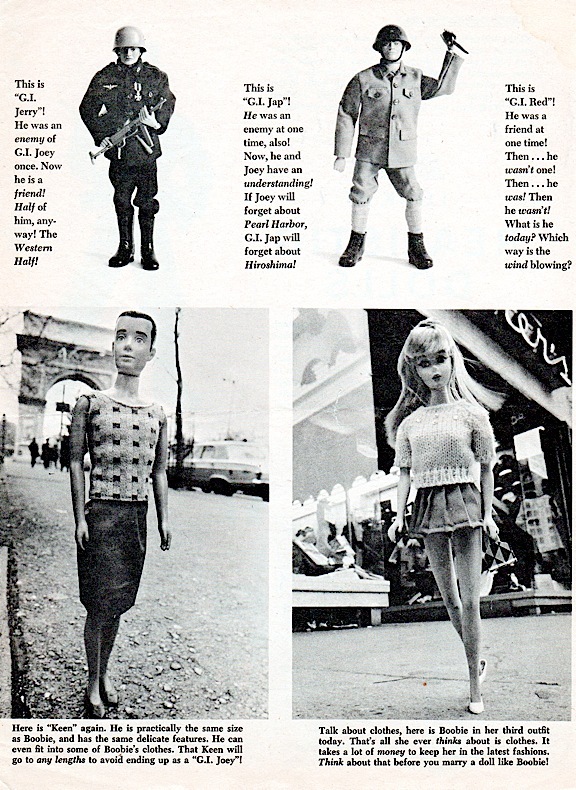 Joe” action figure would make its debut at the 1964 Toy Fair in New York City. Over the next few years, as sales and renown of the toy grew exponentially, the creative minds over at MAD began to take notice of the phenomenon and decided the time was ripe for another sort of “G.I. Joe” parody. 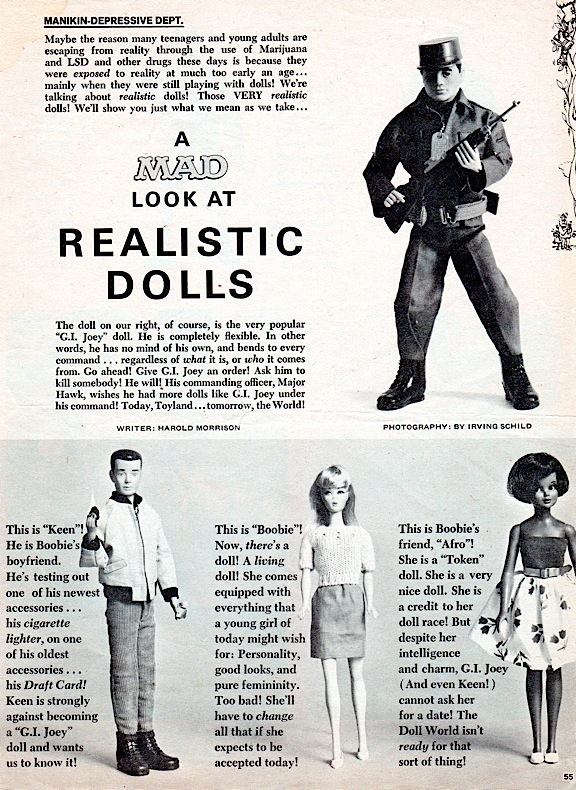 This time, they went with a photos-n-text style layout, resulting in an article entitled, “A MAD Look at Realistic Dolls” (MAD issue #127, June, 1969). This article is three pages of typically silly MAD jokes, poking fun at not just GIjOE, but also at Barbie and Ken as well. It’s full of the usual clichéd stereotypes, such as Ken waiting at the airport before draft-dodging his way up to Canada. But to see how things have really changed over the years, take a closer look at some of the writing in this article. Nowadays, you probably couldn’t get away using pejoratives such as “Japs,” “Limeys” or “Frogs,” much less refer to a black Barbie as “Afro” the “token” doll. 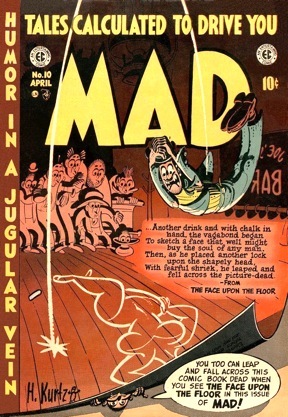 Of course, MAD’s humor has always been bluntly juvenile, often using terms not considered “politically correct” or in common parlance. 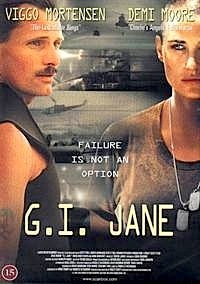 It was only a matter of time before GIjANE would receive her much delayed, “equal treatment,” and with the release of Ridley Scott’s G.I. Jane in 1997, work on a new movie satire was quickly underway. The resulting comic article was a typical MAD farce dubbed, “G.I. Shame,” appearing in issue #365, June, 1998. 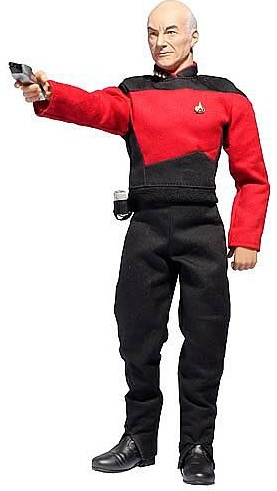 Dragon’s new 1:6 scale Captain Picard action figure is about as realistic as you can get. “Toys ‘R Us has partnered with Entertainment Earth! Toys ‘R Us acknowledges the true value collectors prize in rare items that ultimately add worth to a collection. Therefore, as a tribute to each of our collectors, Toys ‘R Us presents a unique partnership with Entertainment Earth®, Inc. to provide you with the ultimate collector assortment. This will include the newest, hard-to-find, and limited edition action figures, dolls, statues, bobble heads, novelty collectibles and more. Together, we’ll now offer thousands of collector items along with a “Mint Condition Guarantee™” on all Entertainment Earth items purchased on toysrus.com. Dragon’s Data even comes with his cat. Meow! Entertainment Earth has indeed shown itself to be a major mover of merchandise, and its partnership with TRU is sure to benefit both companies. However, it’s also a sad truth that with the rise of the internet, many collectors simply no longer feel the need to visit actual Toys ‘R Us stores. What the future ultimately holds for these companies and toy retailing in general remains to be seen. For now however, with its new offering of “deluxe” EE action figures and offers of free shipping, TRU hopes to woo collectors to its own website and back into their stores. Let’s hope this new partnership strategy works out and proves beneficial for all involved (especially collectors). 1:6 Scale RC Vehicles Spotted at Toys ‘R Us! I was inside a Toys ‘R Us store myself just yesterday, “doing research” for this article, when I spied two exciting RC vehicles in 1:6 scale: the 2011 3-wheel Can Am by New Bright ($99) and a new yellow, big-wheeled Mustang ($99). Of course, we’re all familiar with the hugely popular Can Am (see photo at right by Astro Dan). You can easily remove its plastic figure and put a Joe on in its place. Just make sure your Joe’s got Kung-Fu Grip so he can hold on tight. See the Can Am demonstrated in an short, entertaining video HERE. As to the Mustang, its doors are fused shut and you couldn’t put a Joe in it without serious modifications, but it’s loaded with nice details, available in yellow and those stickers should come right off (I THINK) if so desired. 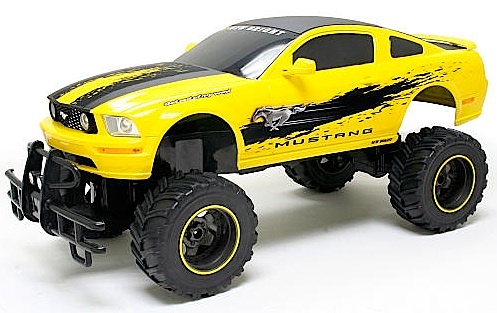 The ‘Stang is also available from the TRU website HERE, but I think the Can Am is now an “in-store only” item (since it was originally released last year). What I spotted may in fact be just some NOS (new, old stock) that has only now put out on display. It’s hard to say. Either way, I was excited to see some 1:6 scale RC vehicles back in a TRU store. One final thing…Don’t confuse the 1:6 scale Can Am ($99) with its 1:10 scale version ($69). 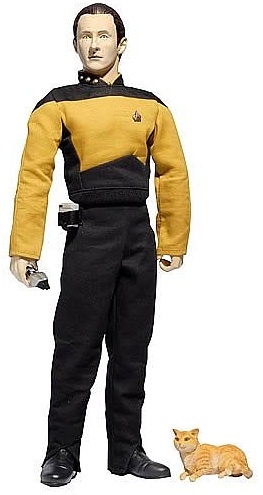 They look very similar, but the 1:10 size is too small for 12″ figures (possibly okay for Kid Action). In our first article documenting GIjOE’s appearances on television and in motion pictures (see April, 2012), we knew that we had only scratched the surface of an immense acting career. It’s obvious that our favorite 12″ action figure loves show business and craves the spotlight, as he continues to pop up, time and time again, in shows and films of all types. “I saw an astronaut on one of the early episodes of “Emergency” yesterday. 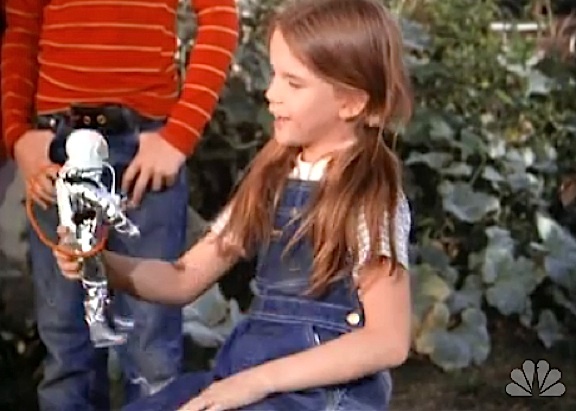 While Gage and De Soto were working on the drunk Daddy, a little girl was shown several times holding/playing with an astronaut figure. Thanks to Chris’ description, we were able to track the episode down. It can be viewed on Hulu.com (for free!) in its entirety HERE. Melissa and Astronaut Joe make their first appearance approximately 17 minutes into the episode. 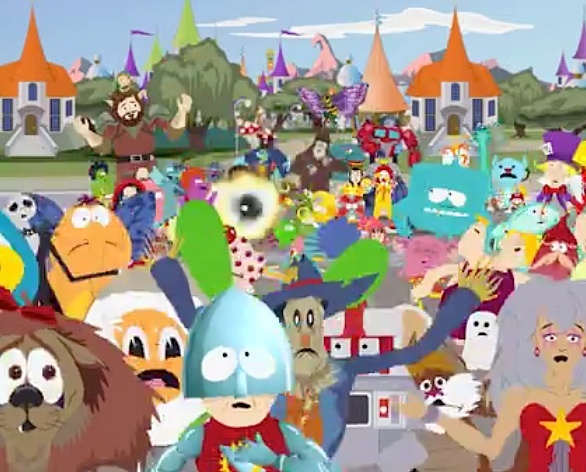 We used Doug’s description to track down this episode of South Park. A rough copy of it can be viewed (for free) over on YouTube HERE. 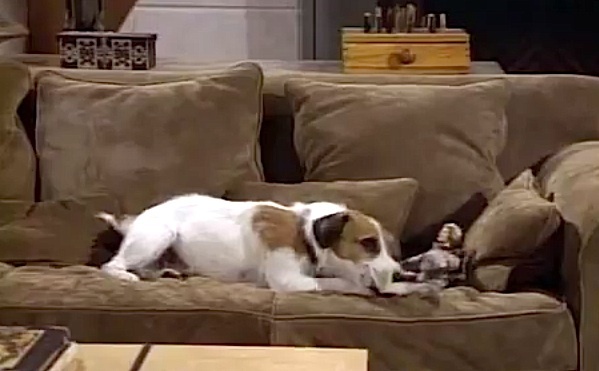 We found this episode of Frasier over on YouTube, and you can watch that brave Duke GIjOE “give his all” for show biz HERE. A big thank you to these three eagle-eyed fans for their help in creating this article. Please keep those GIjOE “sightings” coming in! Last March, I stood transfixed as I watched GIjOE collector and customizer, Wayne Schoenberg, walking carefully across the main Joelanta showroom. In his arms, he was cradling something big. Something UNIQUE. Something most fans didn’t recognize. In fact, I was probably the only one at Joelanta that morning who knew what Wayne was carrying. A couple of weeks prior to the show, Wayne had emailed me some “sneak preview” pics of an amazing custom vehicle he had created. As I slowly crossed the room to get a better look, I found myself holding my breath, because I knew this item was something VERY special. Heads turned, eyebrows were raised, and quizzical looks appeared on the faces of others standing nearby. When Wayne reached the center of the room, he stopped, and then—very gently—placed his unique creation down on the table with an audible sigh of relief. For Schoenberg, a 15-month “labor of love” had finally reached its completion. 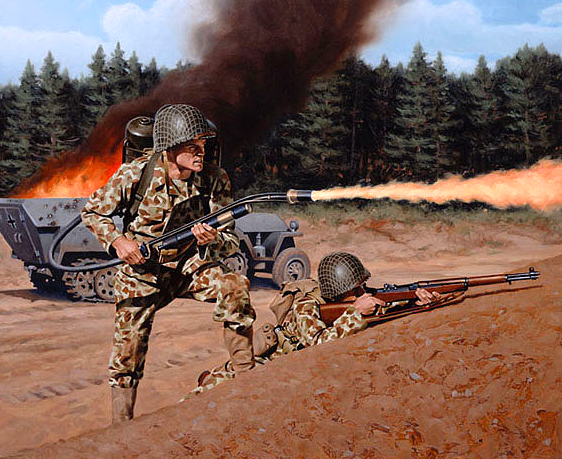 “I chose to create the WC55 M6 version because I had not seen that version done before. After I talked myself into cutting a perfectly good 21st Century Patton Command Car into pieces, I got started. First, I removed the roof, spare tire, windshield, etc., anything that might be broken during the project. I separated the body from the frame and cut it in half 5½” behind the front fenders. I used 3/16” foam board to get the rear cargo area/gun shield measurements correct. 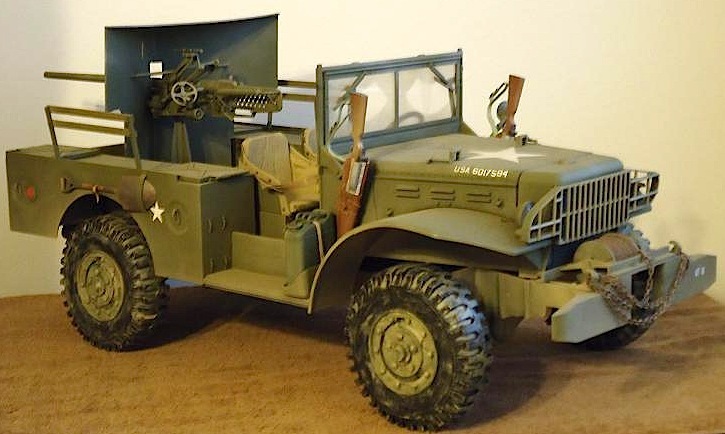 Then, I transferred the measurements to sheets of styrene, added hobby chain and nylon string to the winch, some wires to the headlights, mounting brackets for the rifle scabbards, plus straps, buckles and a chain for the Hasbro fuel cans and holders. 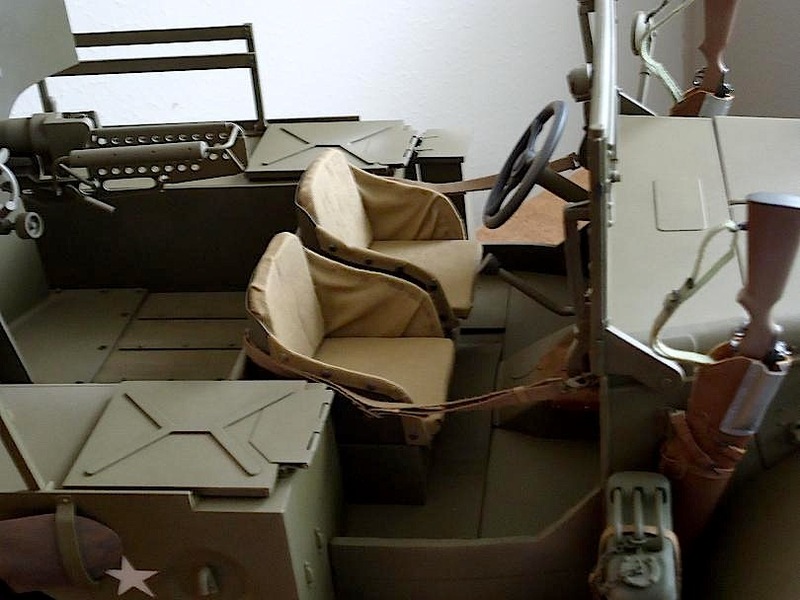 Next, I added rivet blinds for switches to the dashboard, made the seats covers and cushions, seatbelts, a ration box, ax, shovel mounting brackets, some canvas top tie-down hooks and a chain for the tail gate. The 37mm gun came from the Dragon model kit. The ration boxes were made out of basswood and their labels were created in Word. I worked on the truck whenever time allowed, averaging 3 or 4 hours of work done per week. When completed, it took me around 15 months to complete. 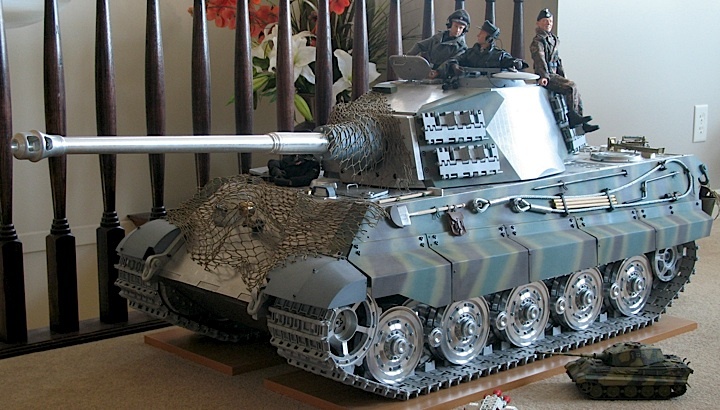 I found a fully assembled and pre-painted 1:6 scale King Tiger tank over on ebay the other day. “Sweet!” I thought, until I saw noticed its price tag: $9,000 plus $1,000 for shipping. WHOA! Even if I could afford such an extravagance, I knew that my personal price threshold would always prevent me from even considering such an expenditure. Not that I’m particularly cheap; it’s just that $10,000 for a toy tank pushes all of the WRONG buttons in my brain. I continued browsing for more affordable 1:6 armored vehicles, but the memory of that unattainable “$10,000 Tank” kept coming back to haunt me. I realized that my brain was having sort of a subconscious tug-of-war with itself, battling back and forth between the LOGIC of knowing that I’d never buy such an expensive toy, and the PASSION that all collectors must feel whenever they discover such a beautiful piece. Of course, every collection reflects its owner’s personal preferences and financial wherewithal. To see what I mean, take a some time to view a few of the breathtaking collections showcased over on the GIjOE Collections website (found HERE). Some of the Joe Rooms and collections you’ll find over there are so “over the top” your jaw will drop open in disbelief. 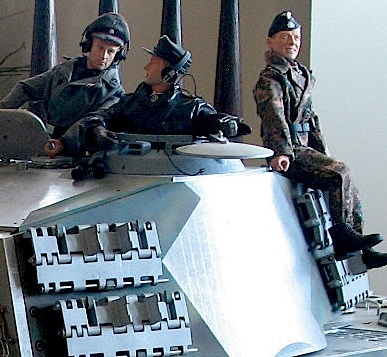 Many also include handcrafted, custom vehicles (such as the Tiger tank shown in this article) that required months or years to create and some serious money to purchase. (So SOMEONE’s been buying them—#@!!). Bottom Line: If you have a moment, please leave a comment here on The Joe Report describing how you feel about your own collecting and purchasing habits. What is YOUR “personal price threshold” for items in your collection? How much would you pay for a vintage figure? Or this tank? How much is TOO Much? Whatever your answers, Happy Collecting! 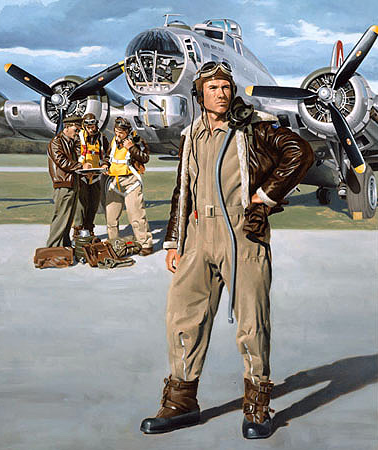 “Rocketeer” Uniform Set Grounded———Until 2013! “Here s the deal. Unfortunately, we needed to put the Rocketeer uniform set on hold in order to focus on a special Holiday release for Toys ‘R Us. 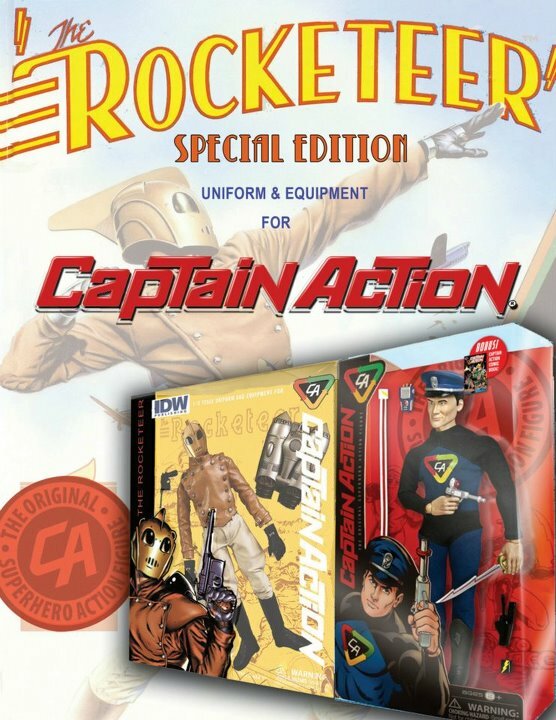 We still very much want to do it (the Rocketeer set) and will be revisiting the notion in 2013. Sigh…They say “Good things come to those who wait.” I guess we can all continue to wait a little longer. Especially for something as cool as this new Rocketeer set. Whoooosh!